Petitioners are asked to report to the Gainesville courthouse at 9:00 am ET, to allow sufficient time to pass through security and complete the check-in process. More information about naturalization ceremonies is available. 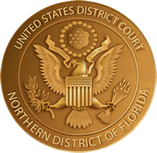 If you need more information about naturalization ceremonies in the Northern District of Florida, please use our online contact form.